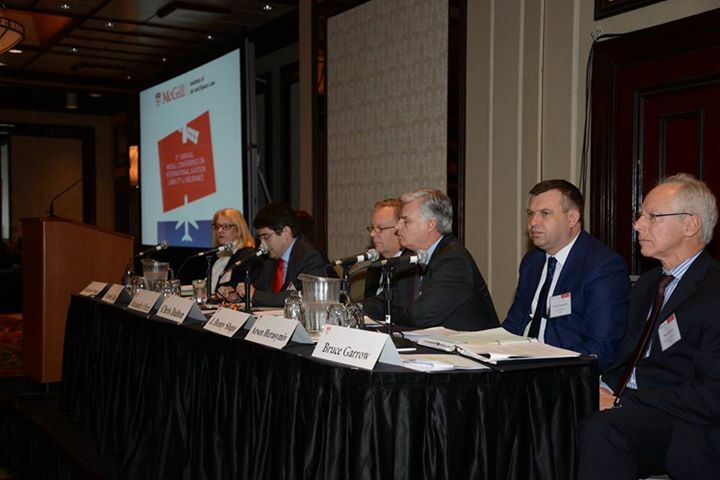 On April 17-18, 2015, Arseniy Herasymiv, attorney at law at Ilyashev & Partners Law Firm, specializing in aviation, participated in the 8th Annual McGill Conference on International Aviation Liability and Insurance in Montreal (Canada). As one of the leading law firms in Ukraine in the field of aviation, in 2014 Ilyashev & Partners Law Firm advised on the Malaysia Airlines Flight MH-17 shot down over the territory of Ukraine. Sharing experience in the field, Arseniy Herasymiv reported on potential claims relating to compensation for damage caused as a result of the air accident at the session “Flying over conflict zones: The legacy of Malaysian Airlines flight MH-17”. The Annual McGill Conference on International Aviation Liability and Insurance brings together some of the world’s leading aviation liability experts to discuss recent developments in the field: liability of airlines, lessors and manufacturers of aircraft and component parts; consumer protection regulation and litigation; unruly passengers and liability for acts of unlawful interference; accident investigations, incident reporting; liability for aerospace transportation; and air carrier liability and alliance immunity under antitrust and competition laws. McGill University’s Institute of Air and Space Law has a rich history of education, public service and scholarship. Its loyal graduates today serve in some of the highest legal positions in the bar, the industry, and governmental institutions in some 120 nations around the world.